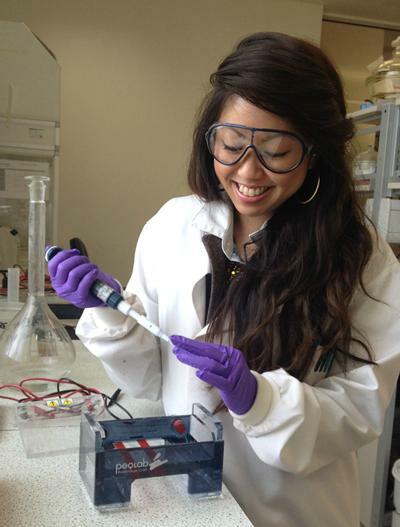 Nancy Wong studied for a PhD in Cellular and Molecular Biology at the University of Southampton. One of the strengths of the department is the opportunities we are given to network and collaborate, and obviously the great academics that we can look up to. The University of Southampton has a lovely and well-presented campus. My first impressions of the University were great and everyone seemed very down to earth; it really made me feel at home. I did my BSc in Biochemistry here and stayed for my postgraduate study as I love the department and it is really the people here that make it that little bit more extraordinary than it already is. My research involves looking at the cellular and molecular biology of a novel set of membrane proteins that could be useful as a drug target. My day-to-day work load is high but I am one of few that have the opportunity to grasp a huge range of techniques and use organisms from three different kingdoms. This has poised me for a great future in any career path I choose and I am grateful to the University for that. What I enjoy most about my PhD is the variety and flexibility that comes with the job; I am able to balance a heavy workload whilst still maintaining a healthy social life - the people really make it for me. My advice is to other postgrads are to work hard, play hard; your PhD is meant to be a challenge but tomorrow is another day! One of the strengths of the department is the opportunities we are given to network and collaborate, and obviously the great academics that we can look up to. The department also has a very functional and beautiful new building - the Institute for Life Sciences. My life at the University has been a very full one and I wouldn't have it another way. I have had the opportunity to manage both a sports club (the Southampton Vixens Cheerleading club) and a society (Biological Sciences Postgraduate Society); I think having a community of mutual interest is important for much the requisite self-indulgence that comes with a PhD. I have attended an international conference in Salzburg and taken part in an entrepreneurial competition, Biotechnology YES. I am currently the editor for the Research Engagement and Enterprise Championship newsletter and I also stand as a representative for all postgraduates in the department; all of which I love to do on the side of my PhD.